DemolitionNews’ Instagram followers declare Caterpillar their favourite. To coincide with the World Cup 2018 that is taking place in Russia at present, we have been using the poll facility on Instagram Stories to ask our 24,000+ followers which brand of demolition excavator they prefer. We have done this via a series of head-to-head rounds that have thrown up some truly momentous matches with Volvo taking on Hyundai, Komatsu battling Kobelco and Doosan taking on Hitachi. 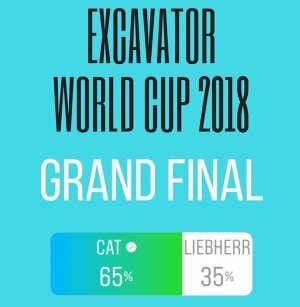 But after three weeks and almost 80,000 votes, we have a winner of the Demolition News Excavator World Cup. And that winner is the mighty Caterpillar which beat Liebherr in a hotly-contested Grand Final. Based on the success and unexpected popularity of the Demolition News Excavator World Cup (and given that we’re in the midst of Wimbledon fortnight) we have decided to run another contest to discover the industry’s favourite hydraulic breaker. So if you’re an Epiroc enthusiast, a Furukawa fanatic, if you rave about Rammer or are mad about Montabert, the head on over to our Instagram Story for the Demolition News Breaker World Cup, and place your vote. Posted: July 9th, 2018 under Equipment.